My little guy turned 6 yesterday. The chubby fingers and baby-speak are giving way to a growing, conquering hero. As I reflected on the boy he is and the man I pray he becomes, I remembered this “letter” I wrote after a trip to the park last spring. It rings just as true today (maybe more so) than it did then. We saw you at the park today…shooting hoops and hanging out with your friends. (Do they still call it that?) I’m sure you didn’t see us…the mom on the bench and the two kids on the playground. You seemed to be more focused on the girls at the picnic tables pretending not to notice you. I get it. I remember how it was to be young and completely self-absorbed. I remember being entirely focused on my life and my world, concerned only with my friends and the right then and there. If you had noticed us, you might have seen the pair of big, green eyes watching in awe as you made that killer dunk. Those eyes belong to my son. He’s five, and he thinks you’re pretty cool. 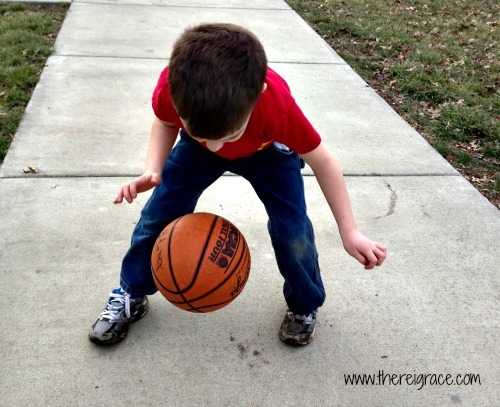 In his five-year-old mind, it seems like an eternity until he’ll be able to make a “real” basket on the “big” goal. But I know the day will come too quickly when he will nail a lay-up as good as yours, maybe even better. And some day it will be him and his friends shooting hoops for adoring girls on the sidelines. I pray he respects his body (and the law) enough to resist the temptation of alcohol and tobacco, which apparently still has some appeal despite all the negative medical findings . And while I’m sure he’ll do his share of “showboating” on the court for some giggling girls, I pray he shows them nothing but respect through his words and his actions, even when they’re not around. You’ve reminded me (again) how thankful I am for my son’s dad, and other men in his life, who will teach him that true manhood has nothing to do with machismo or crudity, but everything to do with strength of character and dignity. I am grateful he has examples of men who run hard after God and work hard serving their families and others. My mama’s heart breaks at the thought that no one stepped up to teach you these valuable life lessons. I’m sorry someone let you down, either by neglecting to lead or, even worse, leading you down the wrong path. I pray someone will step in and teach you what real manhood looks like. Not just for your sake, but for your son, also. Maybe next time we’re at the park, you could look beyond your little world. Maybe you could be a little less concerned with impressing the girls and, instead, notice an adoring five-year-old gazing in wide-eyed wonder at your amateur basketball skills. And maybe if you pay attention…well, you just might learn something. posts e-mailed to you as soon as they’re published. Easy-peasy. Or, follow me on Facebook , Twitter, or Pinterest. Hi Nancy, I read a couple of your blogs and I loved them! Thank you for the letter to a teenage boy and also the one about Christian schools and the great debate. I am the mother of two boys ages 8 and 11 and they went to Christian school since K-5 (my 11 year old did : ) and for the first year EVER my boys started attending public school. I am terrified! But I also trust in the Lord’s provision and protection for them. I loved our little Christian school, but my problem was that I thought my older boy was not making any friends since there were only 9 kids in his class and the other boys in there were not including him in their click. My son is not interested in sports and that is a huge problem around here. The school did not offer any venues for kids who share my son’s interests and therefore he was isolated…this summer we had to move and considered Christian Schools in this area, but they were both too expensive and very small too…we prayed and prayed and continue to pray so now we have just began the year and I think the first week has been better than I expected. I will continue to trust in Him, the One with the plan : ) and I will hope that He gives us the peace that surpasses all understanding and see what unfolds. Thank you again for your wonderful posts and for sharing your story. Gisela, I’m so glad you stopped by and so pleased that you have enjoyed what you read. I understand your fears of public school. I had the same fears. You should read my post about Why We Chose Public School and how we still feel it’s the best decision for us, because that’s what God has for us right now: http://www.thereisgrace.com/why-public-school/. This is beautiful and so reflective of the hearts of mamas everywhere. Stopped by from Time-Warp Wife, what an awesome post! 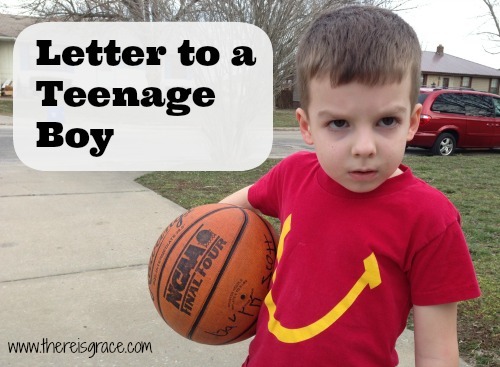 It makes me want to be more encouraging with my husband’s relationships with our boys! Oh this definitely made me cry. Recently we went to the park. My oldest daughter had volleyball practice on the sand courts so the other kids and I played at the park. There was a group of teens, guys and girls, “hogging” the swing set. Let me tell you that it took every ounce of self control I could muster to not go over and wash their mouths out with soap. The stuff I heard coming from their mouths made me cry. I mean really cry. The hatred. The curse words. The things they said others, who they disliked, should do. Twice I had to pick up and move my children and I to new parts of the park because they would get louder and louder. It broke my heart that they had no one to invest in their lives, or that they just chose not to care. My heart aches for community’s youth. Thanks for linking up with Woman to Woman’s Word Filled Wednesday!